by Admin.In Flow, Petroleum, Principals, Transport. Designed for maximum readability – engineered for extra life in fuel deliveries and, fluid flow transactions of all kinds. 1. New crisp, high visibility digital display for optimum readability in all ambient lighting. 2. Latest technology, modern materials give maximum dependability at speeds to 250 rpm of right wheel. 3. Positive action knob reset. 4. Built-in precision totalizer accumulates up to 99,999,999 units. 5. Acetal resin components for smooth operation and extra long life. 6. Fits all popular flow meters. The Meter Register is the outstanding choice for recording and displaying delivery data in a wide variety of industries. In the petroleum refining and distribution field, it is used from the well to pipelines and storage centers, then to gasoline and fuel oil delivery trucks. In the chemical processing field, it can be used for displaying totals during mixing and batching operations. The 7887 Meter Register totalizes and displays high speed deliveries and transactions in large easy-to-read figures. Ideal for increased efficiency in all kinds of liquid inventory and delivery operations. 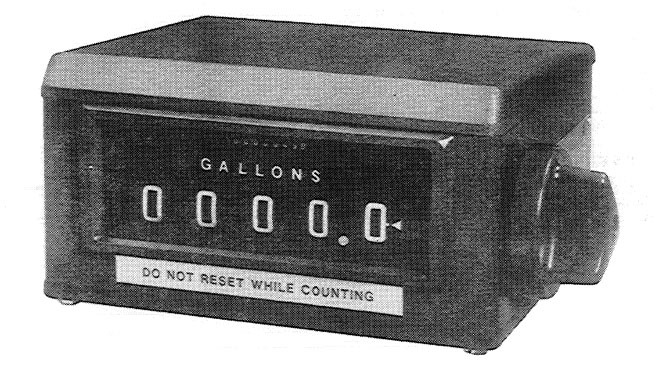 Utilizing a geared drive available in a wide selection of ratios, the Meter Register records in practically any unit of liquid measure – gallons, liters, barrels, etc. – as well as non-liquid units. Special optional adaptors are available to mate the Meter Register with all standard meters and pumps. It also easily combines with Veeder-Root Meter Preset and Printer to form a complete count, control and print system. Finished in corrosion resistant epoxy, the sturdy housing protects the Meter Register in demanding environments and extremes in weather. 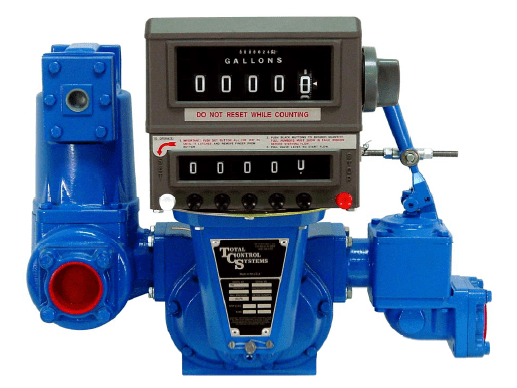 Example: Veeder-Root 7887 Meter Register & 7889 Preset fitted to TCS-700 Series Flowmeter.